Whitney Vickers | Greene County News Members of the American Association of University Professors - Wright State University Chapter, as well as some students and graduates formed a picket line Jan. 22 on the sidewalks leading up the Dayton campus in protest of the university’s contract terms for faculty members. Wright State University officials said students should continue to attend their classes in accordance with their regular schedule and assignments as directed. If a change to their schedule occurs, students will receive an email to their wright.edu address. 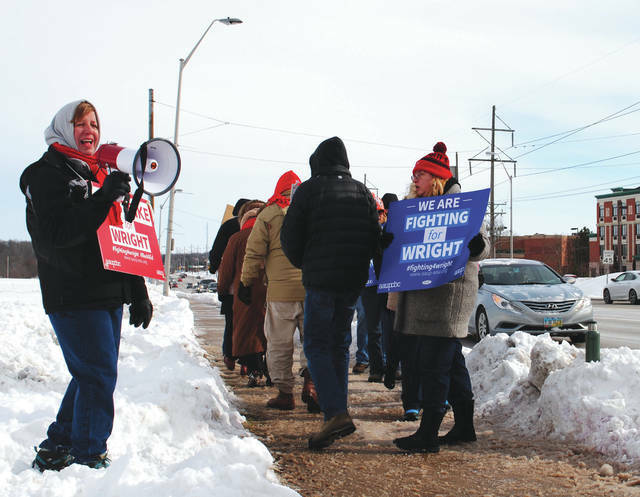 FAIRBORN — Members of the American Association of University Professors – Wright State University Chapter, as well as some students and graduates formed a picket line Jan. 22 on the sidewalks leading up the Dayton campus in protest of the university’s contract terms for faculty members. The two sides were unable to agree on a new deal, causing the union to file a notice to strike after rejecting the last offer from the board of trustees. Despite the walkout, classes went on on all campuses. According to Wright State, a survey of classes and AAUP-WSU members indicated that approximately 40 percent of faculty were still teaching or plan to teach their class, up from an anticipated 33 percent of faculty members Jan. 21. In a press release, school officials also said the administration is receiving information that the number will continuously increase. According to some students standing in the picket line in support of the AAUP-WSU, they are being discouraged from participating in the protest by the university. Students said they have received messages from the university saying that if they participate in the protest, they would experience a negative impact to their financial aid. Students also said there have been “sweepers” going inside classrooms taking mandatory attendance to ensure they’re in class. Other students said they’re going into classes gearing up for a lesson but are being met with either nothing or a sign-in sheet for attendance without the teacher present. Wright State highlighted in its press release that students across campus followed instructions and attended class. It also pointed out that in some cases students would attend class, but no professor would be there despite telling the university that they would be there. In those cases, Wright State said the academic department was contacted and in other cases, students in those classes were given alternate assignments or were dismissed. “I’m also here because I’m upset the university spread misinformation by scaring us into not striking,” Dumas added. Robin Richardson-Coy, a Ph.D student in her third year, said graduate students are advised by faculty members and that some graduate students are now lacking access to their advisors due to the strike. One student pointed out that she “feels like a child caught in the middle of a nasty divorce,” which Wright State President Cheryl Schrader acknowledged. “I know our students feel they are caught in the middle today,” she said. “While many classes went on as normal, some also experienced disruptions. In those circumstances, our students exercised great patience and respect as we knew they would. I thank them for their patience and positive attitude as we continue to assess our coverage requirements based on faculty attendance,” said . Non-traditional student Cori Lohstroh transferred to Wright State from Sinclair Community College and is in her final term before graduating. She said scheduling her final classes gradually became more difficult in her time at Wright State because some of her mandatory classes would only be offered once per week. She said she is on campus Monday through Friday while working three jobs. Wright State said it would continue to work to mitigate further class disruptions. “I want to thank the faculty members who were in the classroom today despite some of their colleagues choosing not to work. We value all of our faculty and look forward to operating with our full complement of faculty members,” Schrader said. Wright State also pointed out that students should continue to attend their classes in accordance with their regular schedule and assignments as directed. If a change to their schedule occurs, students will receive an email to their wright.edu address. Whitney Vickers | Greene County News Members of the American Association of University Professors – Wright State University Chapter, as well as some students and graduates formed a picket line Jan. 22 on the sidewalks leading up the Dayton campus in protest of the university’s contract terms for faculty members. 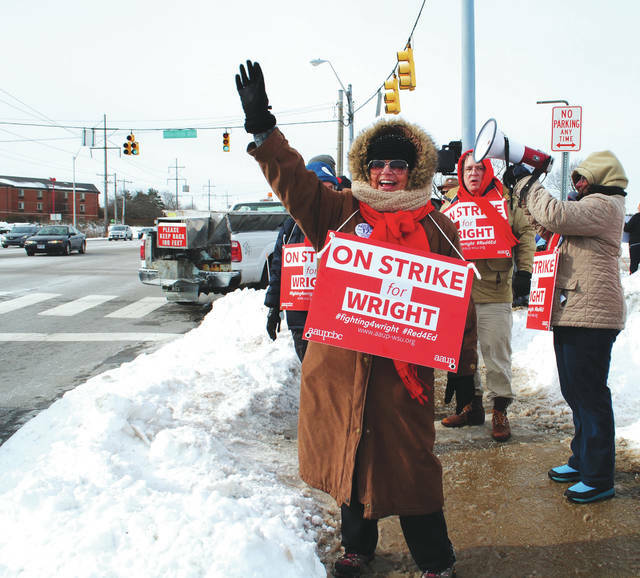 https://www.fairborndailyherald.com/wp-content/uploads/sites/50/2019/01/web1_aaupstrike1.jpgWhitney Vickers | Greene County News Members of the American Association of University Professors – Wright State University Chapter, as well as some students and graduates formed a picket line Jan. 22 on the sidewalks leading up the Dayton campus in protest of the university’s contract terms for faculty members. 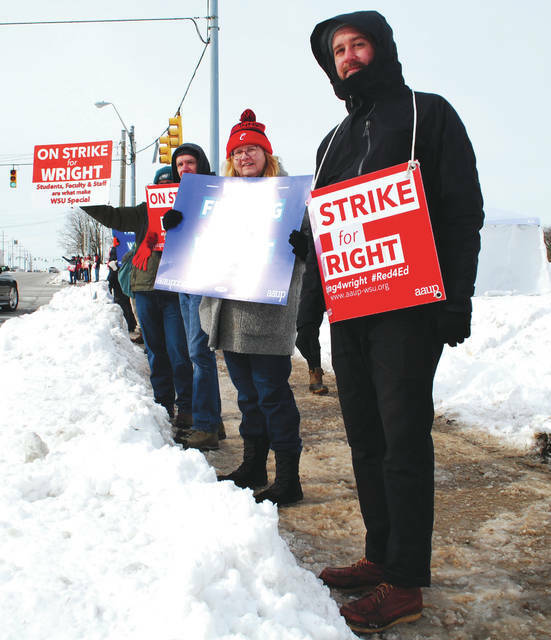 https://www.fairborndailyherald.com/wp-content/uploads/sites/50/2019/01/web1_aaupstrike3.jpgWhitney Vickers | Greene County News Members of the American Association of University Professors – Wright State University Chapter, as well as some students and graduates formed a picket line Jan. 22 on the sidewalks leading up the Dayton campus in protest of the university’s contract terms for faculty members. https://www.fairborndailyherald.com/wp-content/uploads/sites/50/2019/01/web1_aaupstrike5.jpgWright State University officials said students should continue to attend their classes in accordance with their regular schedule and assignments as directed. If a change to their schedule occurs, students will receive an email to their wright.edu address. https://www.fairborndailyherald.com/wp-content/uploads/sites/50/2019/01/web1_aaupstrike2.jpgWright State University officials said students should continue to attend their classes in accordance with their regular schedule and assignments as directed. If a change to their schedule occurs, students will receive an email to their wright.edu address.